All throughout the years, Magellans Cross has learned to blend with the development of the city. 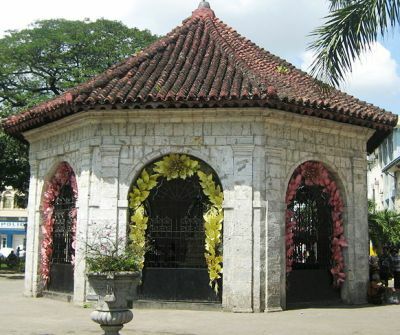 However, inside it, you will be traveling through time, when Christianity was very new on Cebu Island and where Spaniards once ruled its people. The Magellan’s Cross marked the site where the first Christian baptism was held. More than 300 natives, including Queen Juana and Rajah Humabon, were baptized by a Spanish priest known as Father Pedro Valderama. It used to be an open shrine, until the cross was slowly being chipped away by the natives, because of the wood’s supposed healing powers. In order to protect it, a closed structure was built over it. Magellans Cross is a very accessible tourist spot. You can hail a cab from any point of the city, even from the airport. Cebuano taxi drivers know exactly where Magellan’s Cross is so you will not have any trouble with them not knowing where to go. A lot of them are great conversonalists and can provide you excellent tidbits about Magellans Cross. You will not miss it either, it is just located outside of Basilica del Santo Niño and across the main hall of the city. If you are on a shoe-string budget, you can go for a jeepney ride that passes through the basilica or the city hall. Jeepneys are required to show sign boards of their routes, so you can instantly know which of them can give you a ride. Magellans Cross is open to anyone and it is free to enter. However, if you’re coming as a very large crowd, you may want to go in batches, since the place is quite small. The original cross is hidden underneath and one that is made of tindalo is erected in its place. Long candles are sold for a few cents. There are plenty of vendors outside Magellan’s Cross, so you don’t need to look far. Don’t forget to say an earnest prayer and be quiet. 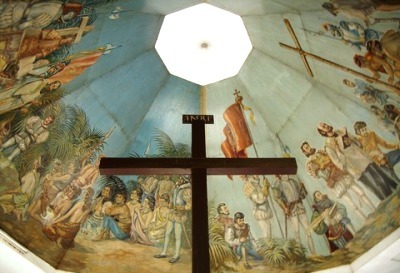 The history of Magellan’s Cross is written on tablets, which you can find inside. It will give you a much better idea about the history of the place and what it means to its people. There are designated stops for jeepneys, so you cannot go wrong, taxi drivers also know where to go so it is all pretty easy. 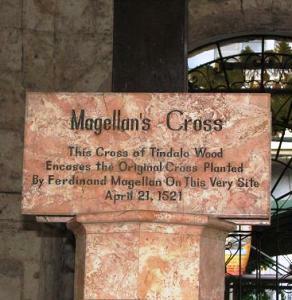 Magellan’s Cross is close to other interesting historical and religious sites, such as Fort San Pedro, Basilica del Sto. Niño and the Malacañang of the South, a former Customs office transformed into a presidential residence and office. Check them all out whilst you’re here. Pay attention to the people around you. A number of them might be thieves, so be on the lookout at all times. Make sure that your camera has a strap, so you can just wear it on your neck. For other things to see in Cebu have a look here.